Please bear with us for the time being. 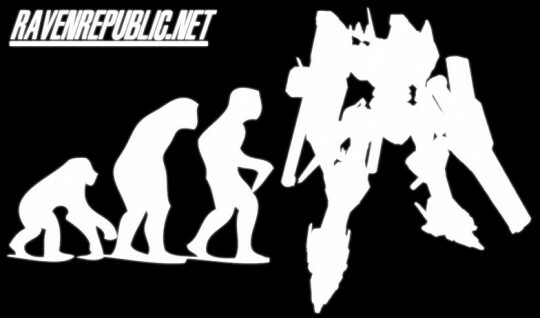 Evolution is a wonderful thing, don’t you think? We here at the Raven Republic certainly think so. It’s what we’ve thrived on these past few years, growing from a small online community who didn’t know each other personally, to a (still relatively) small online community, but tighter-knit this time. Once we were all about just Armored Core, and with no real intention to speak to each other beyond those terms. Now we’ve realized that the wealth of other interesting stuff exists to talk about, even if we’re just talking about mecha. And that’s not all we’re talking about now. So I guess that’s what this new change represents. Growth in a newer, more open direction. Specifically, into the bigger realm of mecha, anime, and video games. And food. Glorious, delicious food. We’re still an Armored Core fanbase though, and a rather loyal one at that. The recent revival of Armored Core on the PSP has us all excited. I realize not all AC players like this new development, but as what’s been proven time and again over AC’s lifetime, you can’t please everyone with a single release. So with that, I bid you welcome to the new and improved RR! Evolution is a wonderful thing. RR Email, Now Powered by Google. Recently I took advantage of Google’s offering of cloud-hosted email for domain owners – we now offer free email accounts to members! It runs on their excellent Gmail service, so it’s a sure win. The offer is limited to 50 accounts only though, so you gotta be quick. To sign up for the service, just post in this thread with the username that you want to use. I will PM you the details shortly after. If you’ve already signed up, click here to log in. A Raven Republic email address. It’s spiffy. Go do it. Sign up today. After what seems like forever, I finally decided to go and put up the wiki. Basically, I hope that in time this becomes an indispensable guide to Armored Core for both beginners and veterans alike, for whatever game in the series. What that means is detailed stuff like stats and accurate timelines; something far deeper and more specific than what Wikipedia has now. Also, unlike the current state of information on AC where you have to search high and low on both well-known and obscure sites just to find the information you’re looking for, I’m hoping we’ll be able to collate them in one easy-to-navigate structure. Given the open nature of wikis I’m hoping to snag a few of you ganados to write things for the place. I know you all know your stuff, so why not show it off? Everything you might need to know about this newfangled feature is here. Just finished uploading about 150 megabytes of pictures to the gallery. High resolution wallpapers, screenshots and scans are there, alongside smaller thumbnails from the previous games. Yes, I know I could have a lot more interesting pictures by lurking here and here but seeing as those are owned by other people and not FromSoft itself, I decided not to. If you’re only going to check out one area from the dozens of new ones, check out the Armored Core: for Answer screens and scans, which are mainly sourced from the AC Wiki. White Glint and that 1st Ranker blue AC are so beautiful in hi-res they make my eyes water. Anyway, just check it out. After a year and a half we finally decided to go and do it: buy ourselves the grand domain name of ravenrepublic.net. Sure some of that underground, free flavor will have been lost, but I don’t think it matters now anyway. We know who we are. Now it’s time to let the rest of the world know. Plus now that I look back having a cjb.net domain makes us look like freeloaders and amateurs. Haha. In case of any troubles with the new address like broken links or error pages, direct your questions and complaints to the help desk. Raven Republic (.net). Spread the word. Portal is now skinned, so for the most part the aesthetics going into the Republic are done. Sophie’s finally made her appearance! Although I must say, being black and white doesn’t exactly strike the eye as much as a colored version will. Keep refreshing to see all her… err… flavors. As for the logo, well, if someone can make us a 800×100 pixel banner (or 800×150 pixels at the most), well, that’d be grand. Sembreaks sure do give you lots of time to finish your stuff. Lightning fast load and refresh speeds, a centralized database, and some nice new software to go along with it. Yep, this is version 3 alright. Everything’s still not back up, but yeah, I took it all with me when we switched over. No content was lost, don’t worry. As of now the only major things missing are the pictures from the gallery. First things first, you should know that this is NOT going to be the default skin. No way am I calling baby blue and white “default.” It’s going to be black. And if you haven’t spoiled the surprise for yourself yet by not looking at my teaser pics from ages ago, I think you’re going to like it. Well, I hope. Sophie’s bound to make an entrance somewhere there, so watch for it. Second, those damn quote tags are giving me nightmares. Some of them didn’t make it across the conversion process intact, and are now bleeding their HTML contents all over the forums. They’re like an infestation of humongous proportions. Here, have a look if you don’t believe me. Again, if you have the power to fix them (i.e., you’re the poster or are a mod), please do. It’s just a matter of editing the post, and putting the text in between orderly quote tags. Yeah, just like from before. Third, about your avatars. Don’t be surprised if they get taken down, as our forum no longer resizes any pic you put in into the allowable dimensions. ‘Di na kayo baby. If you really want an avatar you’ll resize it to 150×150 or smaller, and like it too. Fourth: a chat module that actually works. From here you can see which people are in there, so hopefully if you see one lonely guy or girl you can join them and talk about the soft underbelly of the Internet or something. Ah well, after talking about this for the longest time, it’s nice to see it finally come to fruition. Didn’t come at the best of times, but hey, necessity is the mother of site updates (yes, it really is! ).